The recall, which affects Subaru Legacy, Impreza, Outback and XV Crosstrek models, is the result of a remote starter malfunction. Subaru is recalling select model year 2010 through 2013 Legacy, Impreza, Outback and XV Crosstrek vehicles because the remote starter feature may malfunction and start the vehicle without warning. The recall affects models equipped with an automatic or CVT transmission and an Audiovox remote engine starter (RES) accessory. The RES fob could malfunction when dropped and randomly transmit an engine start request without employing the button, according to the National Highway Traffic Safety Administration. Subaru’s recall impacts 47,419 vehicles in the United States and 2,819 in Canada. As a result, the engine may unintentionally start and run for up to fifteen minutes. The engine may continue to start and stop until the fob’s battery is exhausted, or the vehicle runs out of fuel. There is also the risk of carbon monoxide build-up which may lead to asphyxiation, if the vehicle is parked in a garage or other enclosed area. Thursday’s recall does not affect original equipment keyless entry fobs. Subaru will begin notifying owners of the recall beginning in April. Authorized dealers will replace RES key fobs for free. In the meantime, drivers can contact Subaru at 1-800-782-2783. Subaru’s recall campaign number is WQF-42. Concerned customers can also contact the National Highway Traffic Safety Administration’s Vehicle Safety Hotline at 1-800-782-2783 or go to www.safercar.gov. Subaru began investigating the issue in December and noticing an increase in warranty claims. According to files submitted to the NHTSA, Subaru’s part supplier made a change to the key fob in 2011, which was deemed the cause of the problem. The automaker finished its investigation last month. The news marks the second recall for Subaru this year. In January, Subaru recalled 634,000 vehicles due to a lighting issue that may lead to smoke or a fire. 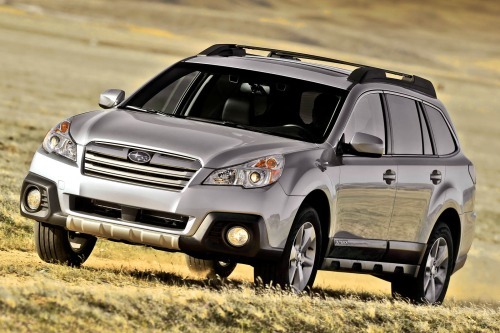 The recall covers 2009 through 2012 Subaru Forrester, 2010 through 2011 Subaru Legacy, 2010 through 2011 Subaru Outback and 2006 through Subaru Tribeca vehicles. Affected vehicles may be equipped with defective puddle light accessories, which light the area under the door. Certain puddle lights may short circuit when paired with an ignition source. Consequently, the short circuit may produce heat, which can melt the plastic and cause a fire. Additionally, Subaru also recalled model year 2012 Legacy sedans and Outback wagons over a side curtain airbag flaw last year. The airbag issue may result in improper airbag deployment in the event of a crash. The recall affected nearly 400 vehicles. Hey, at least they start!